Netflix Is Sure As Hell Coming To The Playstation 3. More to the point, if you have a Netflix and PSN account, the service will be free to access. 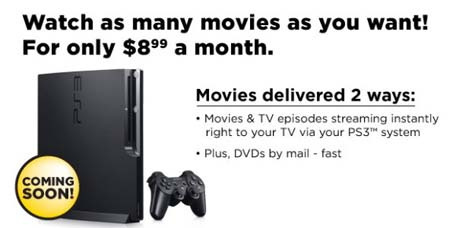 "Netflix expects to begin streaming via the PS3 system next month at no additional cost to Netflix members in the United States who have a PS3 system." You won't need to use your computer either — you can manage your Netflix queue directly from the PS3. Initially Netflix will work via a disc that you can order for free from here, but it looks like Sony plan to extend the application to the XMB as soon as possible; probably alongside the next firmware update. It's going to be interesting to see how Microsoft responds to this. A loss of exclusivity, and a cheaper alternative. Sony really are bringing it this year aren't they?